First established in 1993 under the “Michigan Heritage Route” program to identify and promote state trunk lines with distinctive scenic, cultural or historic attributes, these byways were recently reorganized to align with the award-winning Pure Michigan campaign. There are more than 20 routes in six distinct categories currently designated throughout the state (MichiganHighways.org). In 2010, the State Historic Preservation office erected a Michigan Historic Marker recognizing the West Michigan Pike in New Buffalo, the southern-most city along the full 400-mile route. The following year, award-winning authors M. Christine Byron and Thomas Wilson released their “Vintage Views Along the West Michigan Pike: From Sand Trails to U.S. 31,” which gives an historical account of the century-old route. Construction of the West Michigan Pike first began in 1911, bringing Chicagoans to the shoreline communities of west Michigan to enjoy the natural beauty and small town charm. It was one of the nation’s first tourist roads, taking more than a decade to complete. Early on, the Pike was designated as one of the first state trunk lines (M-11), was incorporated into the nation’s first federal highway system, was widened and rerouted as a superhighway and became the first continuous hard-surface road along the Lake Michigan shore. 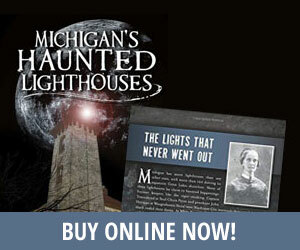 Over its 100-year history, the route—in part or as a whole—has been known as or affiliated with several different names including the Dixie Highway, Blue Star Memorial Highway, Red Arrow Highway, US-31 and the Lake Michigan Circle Tour. 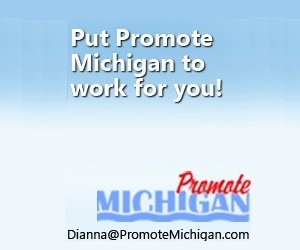 This Pure Michigan Byway™ encompasses parts of I-94, M-63, I-196, I-196 BR, US-31, US-31 BR, M-140 and US-10. 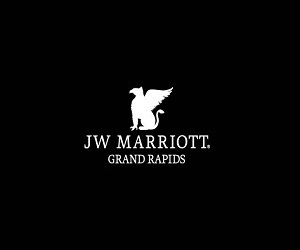 Side 1: At the turn of the twentieth century, deep ruts and sand made West Michigan roads nearly impassable. In 1911, the West Michigan Lakeshore Highway Association was founded to promote the construction of the first improved highway along Lake Michigan in order to bring auto tourists from Chicago to Michigan to support the new resort industry that grew up when logging ended in the region. 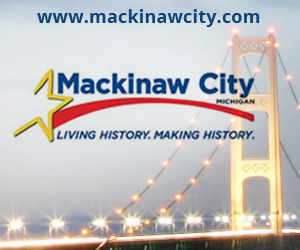 Completed in 1922, the West Michigan Pike extended from the Indiana state line to Mackinaw City. It was designated one of the first state trunk lines (M-11) in 1917, as part of the Dixie Highway in 1923, and incorporated into the nation’s first federal highway system as US-31 in 1926. Straightened and realigned over the years, it is also known as the Red Arrow and the Blue Star Memorial Highways. Side 2: The West Michigan Pike, advertised as “Lake Shore All the Way Chicago to Mackinaw,” was completed as a paved highway in 1922. Tourists, particularly those from Chicago who sought cooler temperatures by coming to Michigan, gained greater access to communities dotting the Lake Michigan shore between the Indiana state line and the Straits of Mackinac. In 1926 the pike (M-11) was designated US-31. By then, traffic congestion and poor road conditions were again impeding Travel. 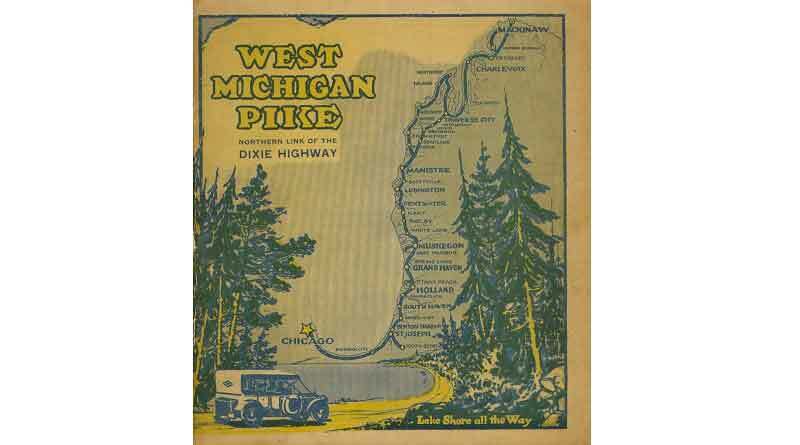 The West Michigan Pike Association, which had started the road, advocated for US-31 to be widened and rerouted in 1929 as a “superhighway.” A full-blown tourism industry with lodgings, restaurants, and attractions grew up along the West Michigan Pike and flourished into the twenty-first century. 1 historic cairn named in honor of Hugh Gray, founding president of West Michigan Tourist Association (formerly Michigan Tourist and Resort Association) off US-31 near Kewadin in Antrim County.